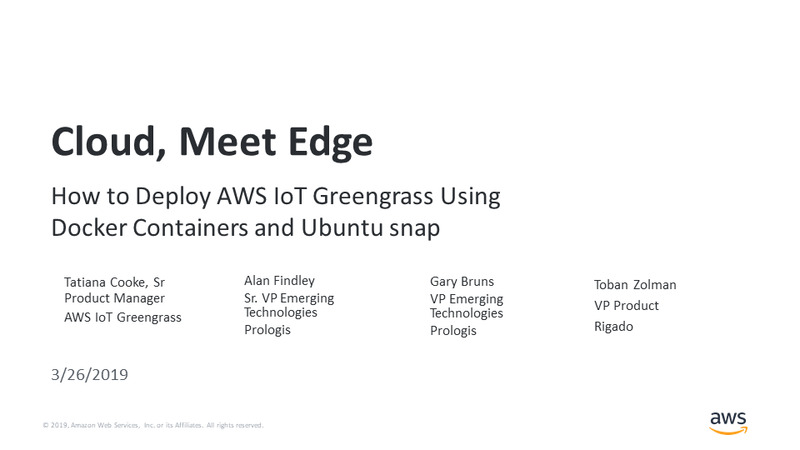 AWS IoT Greengrass seamlessly extends AWS to edge devices so they can act locally on the data they generate, while still using the cloud for management, analytics, and durable storage. With AWS IoT Greengrass, connected devices can run AWS Lambda functions, execute predictions based on machine learning models, keep device data in sync, and communicate with other devices securely – even when not connected to the Internet. Today, customers want to leverage IoT Greengrass by deploying software to a variety of devices and operating systems - whether that's a “traditional” deployment to a Linux OS, snap deployment to IoT Devices with Ubuntu Core, or deployment to machines running Docker like your dev laptop. Join us in this tech talk as we demo how to deploy IoT Greengrass and connect to local devices using Docker Containers and Ubuntu snap. We'll show you how to implement a smart fan system that uses IoT Greengrass in a Docker container on a dev laptop to help prevent your environment from overheating based on local signals and logic. We’ll also feature a customer use case describing the Warehouse of the Future from Alan Findley and Gary Bruns at Prologis Labs and a partner software implementation using Greengrass snaps from Toban Zolman at Rigado.